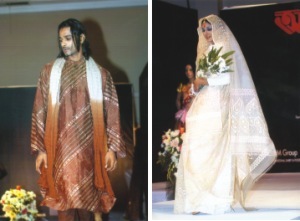 It was a Saturday evening of glamour at Hotel Sheraton on October 30, 2004. 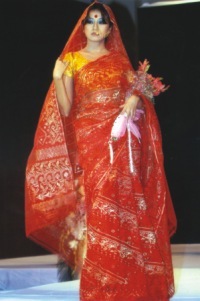 The Eid Fashion Contest 2004 organised by Annanya, the most popular fortnightly magazine for women in Bangladesh was a relief from the more austere daily routine of the Ramadan month. Hosted by popular model Azra, the contest began its display of both the established and upcoming houses of the country. Well-known faces like Lisa, Emi, Tina, Atashi and many others took to the ramp to show off the Eid collections. The ramp show began with Bichitra, flaunting its traditional cotton saris fused with turtle-necked sweaters, black frames on the eyes, antique jewellery and matching purses. This was followed by many more designs, belonging to various organisations such as Nabarupa, Motif, Kay Kraft, Grameen and many more. The different fabrics of shalwar kurtas, panjabis and saris complemented the lights while the mood was set with a mix of fusion music. The event was attended by Tasmima Hossain, the editor of Anannya, Lorraine Barker, High Commissioner of Australia, Geetiara Shafia Chowdhury, chairperson of Adcom and an icon to the International fashion world, Bibi Russell. Anannya, through the years, has recognised the women of this country, who have achieved success in a predominantly male world in various fields such as writing, education, entrepreneurship, the arts like music, dance, theatre, journalism, the films, sports, architecture and law. This fashion show was a platform for designers to explore their creative instincts. There were chiffon saris, splayed over with colours, depicting elements from nature. Shalwar kurtas were adorned with soft, pastel coloured and tissue dupattas. Panjabis in cotton, khadi and silk were also displayed, however mostly in the traditional colours of white and cream, besides some of the other primary colours. Naborupa, a well-known fashion house in the country, won the Eid Fashion Contest, receiving accolades, besides a 21 inch colour television! Their creations, which were displayed at the fashion show, have a fine collection of traditional and contemporary patterns done on silk, cotton and muslin. Mohammed Badul, the owner of the house and Faisal, one of the many young designers of Naborupa proclaimed that the unique quality of their designs was that the materials and fabrics used in the creations are manufactured by Naborupa itself. "We have our own factories that produce silk, muslin and cotton," said Badul. "We also export the silk and muslin overseas, besides using them for our designs." Faisal, one of the many designers of Naborupa, exclaimed that the award was the return of the immense amount of hard work put in by all the workers and designers of the fashion house. The evening finally came to an end, which was followed by a long procession of designers and boutique houses, receiving prizes in different categories of work from the editor of Annanya herself.